provides the supports for smooth research process, designs strategic plans based on previous research and patent strategy, and explore research themes that Huons can select and focus, thus contributing to developing competencies for long-term developments. Furthermore, they are pursuing business models through technology adoption from open innovation and external/internal collaborations. primarily does research into dosage forms of new drugs and modifying new drugs and develop generic products and OTC products. It also conducts research on how to improve the efficacy of existing drugs, and development of drug control and release for patient convenience and composite drugs. With accumulated technologies for drug development, it focuses on research into dosage forms that allow drugs to exhibit outstanding effects of new drugs in human body. Plus, considering our buyers’ financial burden, we are developing drugs whose safety and effectiveness is equivalent to that oforiginal products and various new OTC products. 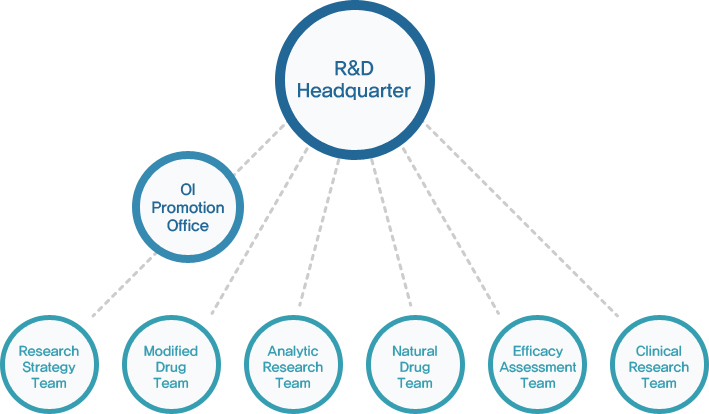 uses excellent talents, experimental facilities and equipment, and accumulated know-hows and supports efficient analytic research on drug development, develops new analytic methods for new materials and dosage forms, and suggests criteria and analytic assessment methods for dosage forms. Furthermore, it prepares news articles for new and existing products and undertakes safety tests and medical equivalency tests for the maintenance and renew of national permit for our medical products. develops more standardized medicines through various manufacturing research including extracting and refining natural components such as crude medicine, plant resources, and microorganism and accelerates the development of high quality natural medicine featuring safety and outstanding efficacy. Through the efforts, we aim at entering global natural medicine markets as well as domestic ones. undertakes clinical tests to prove safety and efficacy of medicine and medical equipment in accordance with international standard GCP, domestic standard KGCP, and other relevant acts to clinical tests. Also, it is leading tests considering the rights and benefits of test subjects thoroughly.